Produced by Mind street and featuring the vocal talents of Cinnamon Brown, this tune will have audiences singing, dancing, and clapping their hands towards the dance floor. This release contains 3 versions of this soon to be new groove classic. The Original, Retouched groove and Groove Assassin mixes with an authentic soulfull style and an earth shaking bassline. They’re smooth and funky, but worthy of massive peak hour play. We’ve also included a Groove assassin creative, latin influenced with many percussion. 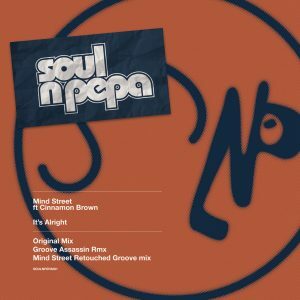 This perfectly arranged remix retake the sax from the Retouched mix, killer keys, and some real timbales played by Mind street for Groove Assassin. It’s Alright is a track that contains everything you’ll need to move any crowd, anywhere.